Carol Buehrens is a Customer Experience Strategist, Author, Keynote Speaker and Educator, focusing on constructing extraordinary experiences for over 30 years for major companies such as Liberty Mutual, Northrop, McDonnell-Douglas, Bechtel, GE, Mercury Marine, and ICW Group Insurance Companies. Her passion for improving customer experience has resulted in numerous awards, including the “CX Innovation Award” from the Customer Experience Professionals Association (CXPA), ICW Group CEO Award, and the Liberty Mutual Star Award. Carol provides organizational workshops and University-level education on Customer Experience. She is the Customer Experience Program Chair at Rutgers University and serves their Leadership Board, where she helped designed the first University-backed Customer Experience Certificate Program. She is a Professor at Rutgers University, California State University Fullerton (CSUF) and University of California San Diego (UCSD). Ms. Buehrens is a Founding Member and Expert Panel Member of the international Customer Experience Professional Association (CXPA), and an Expert Member of the San Diego Customer Experience Special Interest Group (CX SIG). 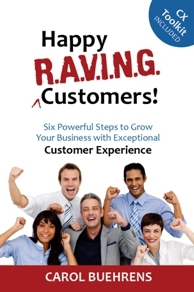 Carol has authored several books on Customer Experience and Computer Aided Design and Modeling, including her best selling customer Experience book, “Happy R.A.V.I.N.G. Customers”.